Well, I’m pretty sure I just had the most hectic of easters in the history of easter. I managed to…. Swim 2 races in different spots on different days. Eat and drink at least my bodyweight in deliciously evil goodness at multiple venues. Good news is that the 2 races, that were as different as chalk and cheese, have provided fodder for some upcoming posts. Bad news is that as part of the process of getting item one complete, the house has been in such chaos I’ve been basically offline and haven’t downloaded any photos or kept anything even slightly up to date. Good news….watch this space for a couple of race reports (apologies for them being a touch late). Check out this hilarious clip….I hope it keeps you amused til I get my lounge room back in order and my blog posts underway! Wow, Bondi was messy on Saturday. Just when you think you’re out of the winter blues, spring throws a nasty one at you! The waves were powerful, but lots of whitewater and a bit churny so weren’t as fun as last week for a body-surf. There are a few things days like that are good for, however. Firstly, they are a great cardio workout. No stopping, no faffing…just get on with it or you end up swimming backwards. Secondly, they are great practice. The majority of the races over the summer season have pretty reasonable conditions, but some beaches and some days that’s a different story. Last year at Avalon….whew…I thought I was never going to get past the break! So training on days where it’s big and rough really prepare you for that. It can really give you an edge over swimmers who train only in pools or who skip training when the weather gets a bit bad. Thirdly, you really need to concentrate. To avoid gobfulls of saltwater or getting dumped (or simply not being able to get any forward momentum), it takes concentration and all your rough water swimming skills. What you can’t do is over think things. Or worry about anything else in the world from the Syrian politics to what’s for lunch and everything in between. It’s a wonderful way to really clear your head. Fourth….the coffee afterwards seems extra good! It was a long weekend here in NSW and a bunch of the 4Seasons crew headed off North to Spring Training Camp. For those of us who were left behind (suffering from acute FOMO) for various reasons there was no scheduled training. Not that we let that stop us! Harnessing the power of Facebook, a sub-group of dedicated ocean swimmers decided to get together anyway and go for our own swim! When we arrived at Bondi conditions were flat and cold. Cold enough that I resorted back to my wetsuit. After a few weeks without, it felt pretty toasty warm! Given it was flat even out the back we decided to go on a little swim safari and swam to the North end boat ramp and then out and around Ben Buckler and into the deep water. I particularly like this swim – it’s rocky and there’s a lot of fish and things to see. It’s also hard to do most of the time as the waves get rough and can break pretty hard out there, so it was nice to take advantage of the conditions and go for an explore. Once we were out pretty deep we decided to head back in, regroup again at the boat ramp and consider a point to point. When we got there, given the time and that I had other commitments in the afternoon I (and a couple of other swimmers in the same situation) decided to head half way and then in. Which is what I started to do. Until I saw that there were some pretty nice looking waves breaking a bit earlier than I’d planned to turn in. I’m a sucker for a decent body-surf and haven’t really had much of that action lately, so I changed course and headed in. I’m soooooo glad I did. The waves were amazing!!! They weren’t huge, but were breaking at the point on the sandbar where you could stand and throw yourself onto them, and they had this great power and forward momentum that meant you could ride these babies all the way into the sand! Most of the other swimmers came and joined me, and even a couple who weren’t particularly experienced with body-surfing managed to catch some of these killer waves. You could not get the grin off my face as we caught wave after wave after wave. I could have happily stayed there all day, had I not jam-packed my weekend with other things to do (including a photography course and two dives), so I stayed in until the last possible moment, then headed off for the rest of my weekend with a smile on my face! As the winter swim season draws to a close, I’ve been reflecting on one of the most common things I hear when someone discovers I swim in the ocean every weekend, even in winter. Funnily enough, I’m at a point where I understand their reaction about as much as they understand my swimming. I’m a total convert to winter swimming, and have grown to love its charms. Aside from the question about getting into the ocean, I recently came across an article about Why you should keep on swimming through the winter. This was mainly about pool swimming, but had some good points that apply to all swimmers. As for me, I have quite a long list of reasons why I do it, and why I’ve grown to love it. so here goes…. Less tourists at the beach (and therefore less parking issues) so less crowd-dodging in the water. It’s really not that cold. Not where I live and train. so far the water temperature hasn’t dropped below 17C. There’s actually a lag in water temperature to air temperature, so funnily enough the really cold water tends to be around November when people start thinking about getting into the ocean. And if the water temperature really bothers you. Ummm…heard of wetsuits? No rules against ’em! The water clarity is better. No idea why, but it is totally true. Wildlife. I think it’s a combination of the cooler water and less swimmers around, but there’s more fish, and it’s only during winter swims that I’ve swum with dolphins and whales (and even a wolverine!). Body Surfing. A good enough reason all on its own. A surprising number of winter swim days are actually pretty nice. A quick review of the icebreaker notes shows there was one horrid day, one overcast, and one where it came in started sunny, rained, and then went sunny again. Not too bad all things considered. There’s really no better start to the weekend. Salt and surf and sand, enough of a workout to justify a few wines on Saturday night, followed by coffee and good company! It’s a well-kept secret, known only to a select few, that we actually have a ball out there. Even when the weather is sub-optimal. There’s this whole perception out there amongst the general populace that it’s difficult and cold and you have to give up your Friday night plans…when really, it’s amazingly fun. It’s great for your summer race form. Keeping up training over the winter really gets you trained up for bigger surf, rougher conditions and cooler water. you can work on strength and endurance, and you’re not starting from scratch fitness-wise every year. I know. I’ve given away a few secrets here. So maybe we’ll see you in the water next winter…. Saturday Training – 15th September – End of Winter! Saturday training marked the end of the winter, and more importantly the end of the Icebreaker season! I know it’s actually a couple of weeks into spring here, but for reasons one can only assume were to do with being in tune with the natural seasons rather than subscribing to the unnatural calendar construct devised by an egotistical emperor (or something like that) our winter season went from equinox to equinox. Winter, spring, or any season, it was a cracker of a day! Sunshine and surfable waves and clear water and not too much wind. In celebration of the end of the winter season (and perhaps to gain a final few extra icebreaker points) there were a few more newd swimmers than usual, despite the water being a touch colder than it has bene the last couple of weeks….definitely a shock getting in!!! Our session was quite similar to last week’s, with squares and a couple of rip swims. It was definitely a different experience to last week, though. The weather and the waves for a start. I firmly believe that, even swimming at the same beach at the same time every week, the ocean always gives you something new. Occasionally it’s a lesson in humility, but more often it’s a pleasant surprise. 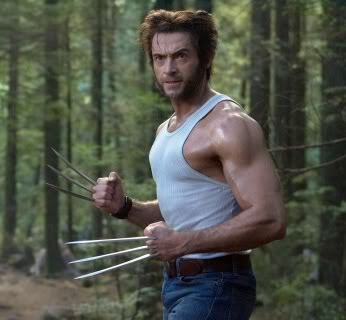 so much as this kind of Wolverine…. So there you have it – winter swimming….whales to wolverines! We went off and had a lovely lunch with certificates and awards and new timetables and new challenges now the icebreaker is over (and perhaps a little bit of champagne!). Watch this space for all sorts of new adventures….as the weather warms up the fun really begins! Saturday morning was sunny and beautiful. I was packing up my swim bag and getting ready when I looked at my wetsuit. It’s so bulky and hard to get on and off and I really enjoyed swimming without it last week. A quick check of a couple of weather apps confirmed that there wouldn’t be much in the way of waves, and the water temperature wasn’t too crazy-cold. Snap decision…left the wetsuit out of the bag. I headed down and met up with Fiona and Ronene. We were talking about the weather and how nice it was on the way. The conversation moved on to how lucky we’ve really been this inter, with hardly any really cold, rainy horrible days. And as we headed closer to the beach, we started noticing some dark and ominous looking clouds forming off the coast. We had jinxed ourselves! By the time we got to the beach it was dark and overcast and starting to rain. And I had foolishly and prematurely decided not to bring my wetsuit! The waves, of course, had also picked up with the wind. Ah well, there was nothing for it but to forge ahead and swim anyway,. It was a chilly entry, but really not too bad. We did some squares out, across and back to the beach, but with a bit of a twist where we had to watch for coach Zoe to turn, and turn at whatever point we were at (ie faster swimmers further out, slower ones not so much). Sometimes she was at the back of the pack, and sometimes out deeper. With the bigger swell it was hard work and at least once I had to actually stop swimming and look around…only to find her nowhere near where I thought she was! This is actually a great activity for ocean swimmers. In a race swimming in a straight line towards a particular point, regardless of conditions, can mean huge gains, so this is a fun but important exercise. For some of the circuits (square circuits…I hope this makes sense!) we caught the North Bondi rip out, and man that thing was FLYING!!! It also had a rare visitor in the shallows….a well camouflaged little wobbegong shark, who I caught a glimpse of (only as he moved) and who was no doubt startled and perplexed by the sudden influx of legs and splashes above him! By the end of the session I was pretty stuffed. Those sets in the bigger conditions were definitely in the cardio vascular zone! And then, wouldn’t you know it, after a quick shower and lining up for coffee…the rain stopped and the clouds cleared and it was a beautiful day again!